Sheila Catford is ranked fifth on the Scottish all-time list for the marathon behind Liz McColgan, Kathy Butler, Hayley Haining and Lynn Harding and above such as Lynn MacDougall, Karen Macleod and Susan Partridge. She is also eleventh on the Half Marathon list and has good times at 10 miles, 10K and 5 miles on the road. However, along with Heather MacDuff, she is possibly the least known of all Scottish ranked distance racers. A lot of that has to do with her domicile being in Yorkshire where she ran for Leeds City AC, but her career as a Scottish internationalist was comparatively short and that added to the complications. Nor is there much information in the press about her, nor are other athletes a good source if information. What follows has been put together solely from information available in the public domain in an effort to paint a portrait of this excellent athlete. Came 1989 and in the London Marathon in April and Sheila finished eleventh in 2:33:04. Doug Gillon reported under the headline “England Snubbed As Lynn Books Her Games Place” as follows: “After having shattered the UK women’s marathon best in the ADT London race yesterday, Veronique Marot snubbed England’s selectors by announcing, ‘I’m not interested in the Commonwealth Games’ … Lynn Harding, first Scot in 2:31:45 beat Lynda Bain’s Scottish best and was well inside 2:35 which guarantees Auckland selection … Sheila Catford, also of Leeds, booked her passport when she knocked 40 seconds from her best time with 2:33:04.” Sheila also won the Moray Marathon on 6th August, 1989 on what was clearly a bad day for road racing (the men’s race was won outside 2:31!) in the slow time 3:10:08. Back racing in Leeds she again won the Saltwell Harriers race in December to set herself up for the Games the following year. The Auckland Games were held in January 1990 and the Scottish representatives were Lynn Harding and Sheila Catford. There was a report in the ‘Glasgow Herald’ on 23rd January, 1990 which read: “Sheila Catford who is due to run in the marathon for Scotland a week on Wednesday, struck a big blow for her morale this evening when she finished second in an 8000m road race in the city’s Domain Park. The winner was the New Zealander Wendy Bisset who is not due to compete in the Games. Ripon-based Catford finished eight seconds behind in 26:07, scoring a seven second victory over England medal hope Angie Pain, the former Glasgow marathon winner.” This time was ranked highly in the GB 5 Miles lists but was demoted to a sidebar marked Measurement doubtful’ The Games marathon was another story however. The race was won by Lisa Martin of Australia in 2:25:28 (eight minutes clear of second placed Tani Ruckle, also Australia) with Angie Pain (under her maiden name of Angela Hulley) third in 2:36:35. Sheila was first Scot and placed ninth with 2:43:48 with Lynn Harding eleventh in 2:47:24 and Moira O’Neill of Ireland (brought up in Scotland as Moira O’Boyle and member of both Clydesdale Harriers and then Victoria Park AAC) twelfth in 2:48:52. All three were well below their normal running form. 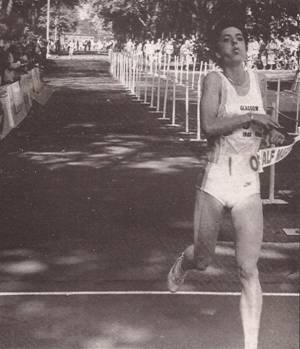 It wasn’t her last marathon in 1990 however because she was third in the WAAA’s Marathon Championship in April (held in conjunction with the London race) in a time of 2:36:42 against the winning time of 2:33:07 run by Nicky McCracken. the following year, 1991, she won the Albo d’Oro della Firenze marathon in Italy in 2:35:37 and the trail runs cold thereafter. She continues to run however and has appearances recorded under the colours of Ripon Runners (“Coaching sessions at Ripon Runners continue with professional ex-athlete coach Sheila Boyde. She recently threw up a challenge to anyone interested in running. “Do you want to get fitter in 2007? Do you want to streamline your physique and be part of a very sociable happy group? If so then join Sheila on Thursday nights at 6:30 at one of Ripon Runners club meeting nights” and Harrogate Harriers (On the first Sunday of the New Year (2009) Harrogate Harriers A Team of Sheila Boyde, Paul Render, Ben Grant and Ashley Brook came second in the Harrogate Ringway Relay covering the 22 miles in 2:18:04.) The Power of 10 has her as a member of Ripon and gives her credit, as a V45 for 10K’s in 39:54 at Melmerby and 40:07 at Harrogate in September in 2009. However it works out, it is good to see that she is still running and running well in addition to putting something back in to her local communities.